The British artist and sound art collective have collaborated to produce one of the triennale’s most simple but striking installations. 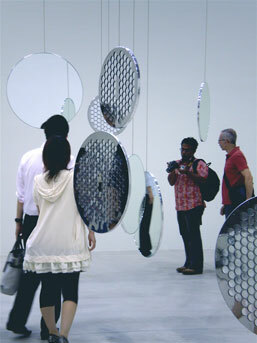 Hanging serenely in the centre of the Shinko Pier exhibition space are sixteen circular panels of shiny metal, some with mirrors for faces, others with speakers that emit sounds that are both melodic and fragmented with occasional beeps, scratches and echoing noise that sounds like background ambience. 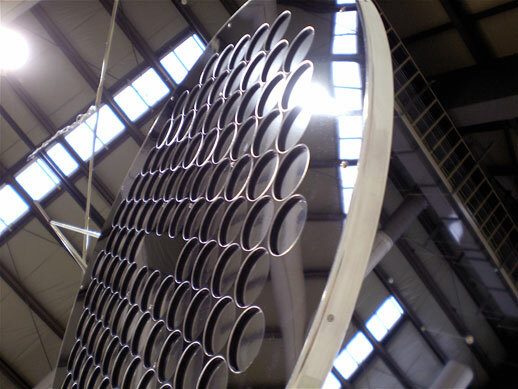 Like a giant mobile, the piece has a formal sculptural aesthetic with a playful edge. 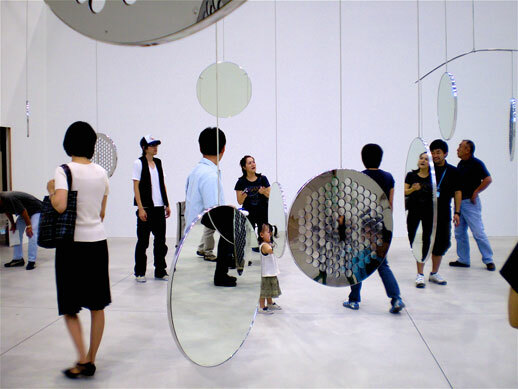 Free to approach the work closely, people wander around it and stand transfixed by their reflections, listening to the sounds that intermittently emerge. Titled A=P=P=A=R=I=T=I=O=N, the piece is the product of collaboration between British artist Cerith Wyn Evans and British musicians Throbbing Gristle. Cerith Wyn Evans is a Welsh artist currently based in London. He makes work used a combination of sculptural and verbal elements such as La Part Maudite by Georges Bataille (1949) (2006) in which sections of text were translated into morse code and flashed out on the lights of a chandelier. This created a sense of eerie communication with an unknown source. Focusing on the limitations of language and the spaces and fissures that can be created through its connection and translation into object form his work is evocative, dreamlike and unexpected in its execution. Exploring the idea of a sonic archive in his slide/sound projection The Curves of the Needle (2005) he recording the extracts of records from his collection being played in Casa Barragán, an icon of modern architecture in Tacubaya, Mexico. The final work consisted of the re-recorded record sounds being played against a photographic montage, the layering or looping of which highlighted the connection between photography and sound as means for collecting memory. Throbbing Gristle evolved out of a performance art collective known as COUM Transmission. Consisting of four members Chris Carter, Peter Christopherson, Genesis Breyer-R-Orridge and Cosey Fanni Tutti, they became notorious for their extreme performances involving bodily mutilation and controversial use of war imagery. Also considered the fathers of “Industrial music”, a term coined by the connection the Industrial Record label, the music associated with this movement was predominantly experimental and connected to other forms of artistic activity. Conceptually they deconstructed taboos and dominant cultural mythologies through the transgression of social conventions a. Re-formed in 2004 they released a limited edition album TG Now followed by Part Two in 2007. A series of art shows at the KW Institute for Contemporary Art in Berlin highlighted their artistic focus: the use of distortion combined with samples and loops and a fascination with the darker compulsions of the human psyche. A=P=P=A=R=I=T=I=O=N is accessible to an audience not so familiar with art: many people will enjoy the way it transforms the space and encourages interaction. For those with an interest in experimental music it shows the possibility of successful cross-genre collaboration. This piece is a hybrid: neither purely sculptural or musical it incorporates elements of both in a way that is formally well put together, phenomenologically engaging and conceptually well thought out. As the beautiful and mysterious panels play sounds we question what is being communicated, what seems to be some form of non-verbal language. Through the use of sound both an internalized space of hearing and an external one related to the body and its position in the installation is created. There is a sense of an absent performer but of what kind one cannot be entirely sure. 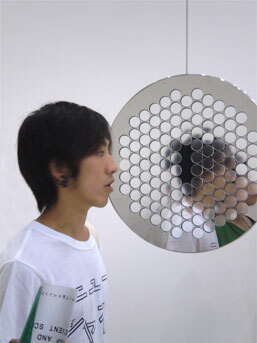 As we listen, our faces reflected in the mirrored surfaces, others look on and we become the performers. We are left to ponder the sense of sounds as an attempt to communicate that which is precisely non communicable. We can view ourselves in the mirrored surfaces but we cannot reach a definitive conclusion about what it all means; instead, this work encourages us simply to slow down and change our perception of space, sound and time.